WPI’s Major Qualifying Project (MQP) in the Architectural Engineering (AREN) program gives you a leg up on the competition when launching your career or gaining admission to the best graduate schools. Designed so that you can experience the real-world problem solving that will soon characterize your professional career, AREN MQPs involve faculty and students participating in ongoing research and design projects, or completing their MQP in collaboration with professional engineering firms. WPI’s MQPs in the Architectural Engineering program requires students to demonstrate integrative engineering and architectural design and analytical skills through a capstone design project in the 4th year of study. As part of their MQP these students designed a solar heating and thermal storage system to minimize energy usage within single-family homes. To better understand the need for such a system and determine how it can benefit home owners, students first studied methods for the optimization of energy performance. In collaboration with a private company, students investigated both passive and active interventions using building energy simulation tools. 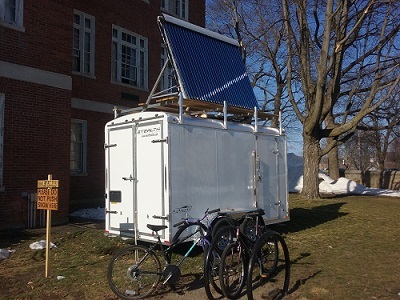 Students further designed, build, and tested an innovative solar heating system, and determined the feasibility of the system for use in residential projects. As part of her MQP, Yan Zhang ’15 developed a proposal for a new addition to Kaven Hall, home of the AREN program and CEE department. 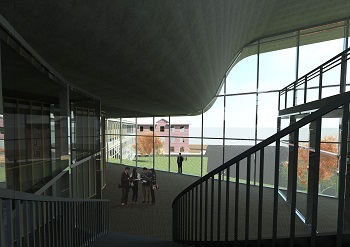 Her architectural design scheme connects the lower and upper campus, encouraging pedestrian traffic through the building while providing additional studio and laboratory spaces for the program. 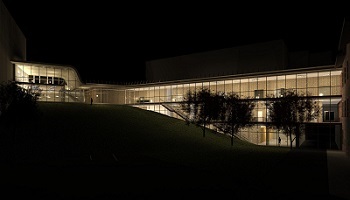 Building energy simulation software was used to optimize comfort and energy use, and architectural details were developed for the extensive glass façade. For their MQP, these students entered the Architectural Engineering Institute Student Design Competition in the Mechanical category. The challenge was to design the mechanical systems for a 17-story mixed-use building at 888 Boylston Street, in Boston. The team provided a comprehensive design of the HVAC, plumbing, fire protection, resiliency, lighting, and energy-generation systems, including cogeneration and active chilled beams. The design process involved calculations and simulations to optimize the energy and water consumption of each system, each of which was modeled and evaluated, and then integrated with the BubbleDeck structural system that a partner team designed. This MQP presented the design of a Campus Center for WPI’s Gateway Park. The team developed architectural, structural, mechanical, and fire-protection plans that met building code and provided a cost-efficient solution, fitting the requirements of WPI’s Master Plan. The team focused on understanding how a building is designed while exploring the relationship between architecture and the engineering components of design.